Yes, I'm going to be a Nana again in the spring! I have lots of time and I also don't. I'm looking at a total knee replacement and recovery period sometime this winter and then throw Christmas into the mix and .... well, time is short! I'd rather not be trying to make something that *special* with a recovering knee as I don't know the healing time frame. So I'm starting on it now. I looked at all my drafts, then my samples .... then I googled Monte Cristo and determined setts. Its thick and fluffy and I was beginning to think that plain weave was all there was to choose from. Then I found a baby blanket project by weaver Sally Orgren that was perfect. Sally is an amazing weaver and its worth checking out her projects at the link. The blanket is a combination of plain weave, five thread huck and window panes. 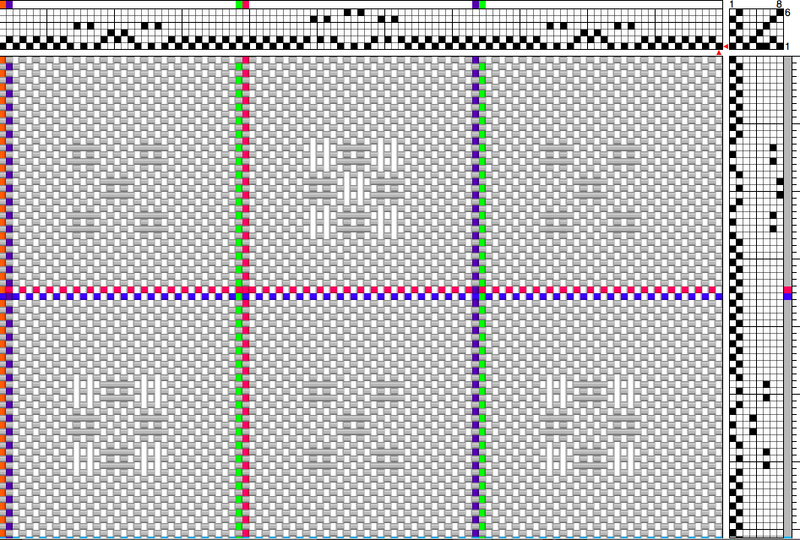 So I changed the colours of the window pane outline and modified the huck lace to add a second style of lace blocks. Its a six shaft, eight treadle draft. Sally also had it set for direct tie up and I changed that too. Then it occurred to me that I would be weaving it on my Louet Spring 90...and it would be the full width! So first order of business was to wind all the skeins into balls..... and that took some time as you can imagine... I would stand and wind the warp for a bit, then sit and wind a cake on my rest break. I used a Woolhouse ball winder for making the larger cakes. Doesn't get used much around here so I even had to dust it. I normally use the smaller Royal brand for the finer yarns. Wound the warp using four full skeins of cotton (plus five ends of a new cake) and got it set up on the loom for beaming. I had pre washed four skeins in advance to help reduce shrinkage. It was like trying to duck marshmallows under water! They also took four full days to dry! The colour brightened up to a soft cream. Bruce helped me wind on the warp and it took a while for a few reasons. Its thick, its full width, its thick, and its stretchy! Below you can see the bow in the lease sticks. The stretchiness of the cotton made it akward. Do I pull the stretch out now or endlessly deal with it later? I felt like a newbie all over again. I opted for being consistent and we took our time. Finally we got it all done. It was a slow process with the cotton binding in the raddle. The 8/4 cotton (doubled) was also behaving weirdly too. It was acting slippery. I'd never thought I'd say that about 8/4 cotton! Before I could thread, I had to tie back all the extra heddles out of the way. I think you'll understand my subtle message when I say I used PINK cotton ties. I don't know anything concrete but its a suggestion! As you can see from the pictures above and below, I used just about every dent except for these seven! I used a ten dent reed and sleyed one per dent. Lots of wriggle room there. Normally I like to lace on but somehow that felt like I would be playing with the warp like a bungee jump and I opted to tie on. The 8/4 was tied separately as I didn't want them 'quarrelling'. I must say that I loved the look of the warp from the back. All straight and orderly. It also shows just how full the loom is! My widest warp on it to date. I ended my day by winding several pirns and loading up the bench with my tools for the next day's start! So yesterday I tightened and closed the knots and then laid in 4 shots of scrap 8/2 cotton to bring the groupings closer together. 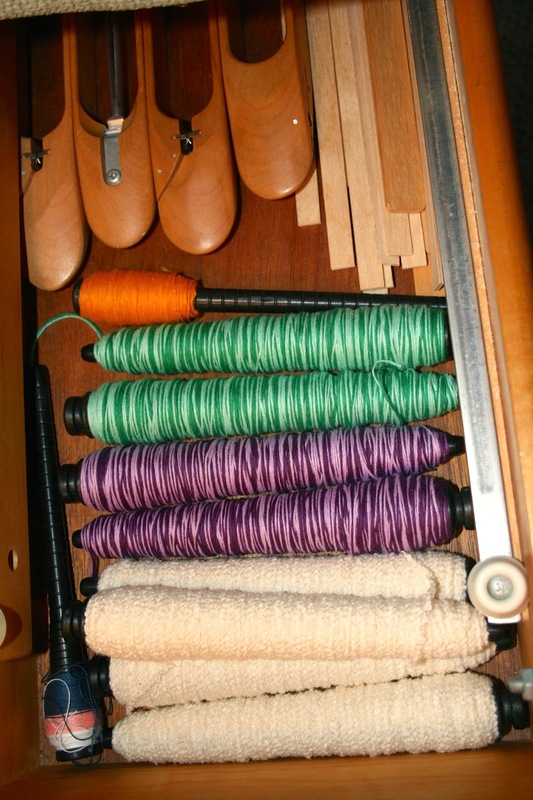 Then I placed two thin warping sticks and then threw four more shots of cotton. As you can see from the close-up below, it really works to get things neatly braced up and ready to go. This cotton is soft and spongy and if you ever needed a "two stick start", its on a project like this! I wove approximately five inches and then started with the coloured divider. Then weave ten shots of plain weave and then weave block A lace, ten shots of plain weave. Repeat and do block B lace in the centre of the next window. Its hard to see the lace as its cream on cream. Actually, I don't really expect it to behave like my recent lace projects at all and form tight groupings. The Monte Cristo is too fat and fluffy to allow crisp definition. It will be more of a central grouping of texture to break up the plain weave, with a touch of colour. The ends will have beige satin binding to secure the edges. ....so I turned the flash off and you can just make out the lace below. As I said, this will be more texture than anything! I started to wonder if I should just treadle plain weave for the entire length but Bruce says it looks better than these pictures show. So that's where I finished. It will be a slow weave as I'm using a temple against the inevitable draw in, moving it frequently and I'm using a larger 15" Schacht EDS shuttle and having to give it a real good throw to cross the warp. I may switch to a heavier AVL and see if that helps! There is warp enough for two blankets so this will take awhile! Good thing I started early then huh? The shuttle worked nicely but my one pet peeve was how the shuttle felt to my hands when catching and throwing. I throw and catch palm up and so the thumbs use the bottom end of the rounded area where the pirn sits to throw and catch. That edge is smooth but still what I would call a 'sharp' edge or angle. The Schacht has a softly rounded depression that the thumb slips into. Its a small detail like that that makes all the difference in the world to the operator, especially when you consider the thousands of throws you make in a project. So the honex tensioner is a big improvement.... shuttle design needs a tweak. The exotic woods are beautiful and its well made otherwise. After my sample was all woven up, I looked to my notes to see how much length I allocated for fringe ..... and there was none! 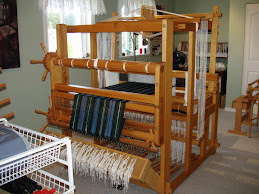 I had calculated for two scarves seventy four inches each, twelve inches samples, then my take up allowance for the woven areas......then I had added in my loom waste of twenty inches and then forgot to add in the fringes! My sample was only six inches and then I reduced the over all woven length of the scarves and I hoped the rest would come out of the loom waste! I left six inches for fringe allowance at the start and end of both scarves and at the end I got finished scarves of seventy inches plus four inch fringe and a second scarf of seventy three inches plus four inch fringes. Phew! I had to laugh at myself as I had never in 20 years of weaving ever left the fringes out before so it seems you are never too old to learn new tricks. I had to play "mental gymnastics" with the warp length and fudged myself up an answer! I had planned to do more blog posting but simply put, I have been ill with walking pneumonia and so my energy has been a day by day thing. That flu/ cold bug we had in August evolved into another situation entirely and I can't seem to shake it. The cough just goes on and on! That's the problem with a compromised immune system when you have SLE lupus. Until I finally get rid of the bug, my surgical date will be 'on hold' unfortunately and that will have a trickle down effect on Life. 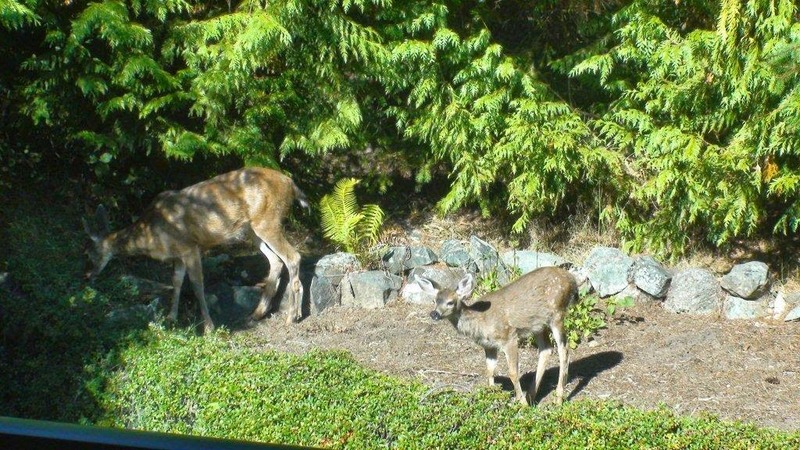 I am enjoying the cooler temperatures and watching the wildlife around the house. 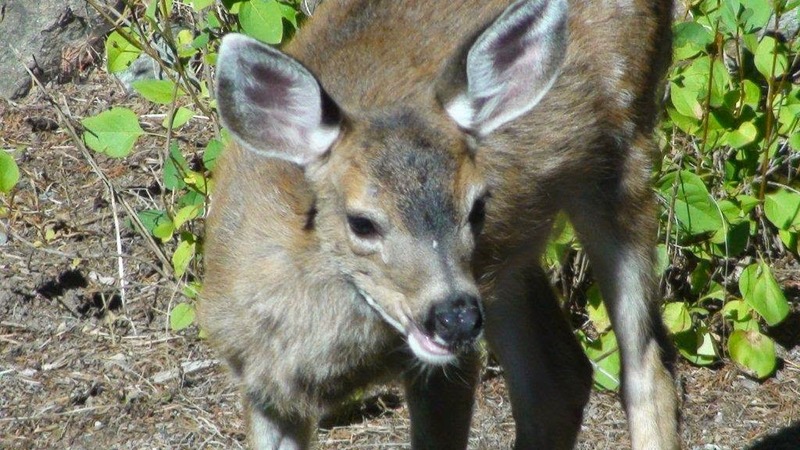 The squirrels are busy in the trees again, and the deer don't even move out of the way of our car when we're using the driveway anymore. .... and then, just like that, its September and summer is (almost) done. Happy Labour Day ! I would love to tell you that I have been out having fun and playing, but no. The cold we both caught in early August was no cold and it became apparent that it was the flu and I spent an uncomfortable three weeks where days blended one into another. I literally did not leave the house for three weeks and when I did, I felt like I had been beamed in from another planet. I had gone for groceries and left a still sick Bruce at home as he was about three to five days behind me. I rallied and started to feel a bit better and even spent time weaving, but a nasty cough reappeared and has stayed with me. A chest x-ray later and it seems I have walking pneumonia now. So more rest and so on.... I would hate to still have this when they finally call me for my knee replacement operation as I would have to pass and wait again! I'm one of those people with a compromised immune system so getting well is a longer go for me compared to other healthy folks. So when I was feeling a bit better, I did get the third instalment of the runners loaded and underway. This time in a deep rich red called cerise. I wove a batch of these last year (draft there at the older post) and they sold quickly for Christmas and I thought I would try them again. So to review: the yarn is 9/2 French linen from Brassards in Quebec, sett 24 epi, and an eight shaft diamond huck lace. I love this pattern as it gives an all over lace effect and is stable due to even placements of plain weave through out. The linen weaves up beautifully, and is very satisfying to hemstitch as it stays tight and neat. Yes, it does lint a bit and I had to vacuum off the loom after each runner. I also ran the weft yarn through a damp cloth as I wound the pirns to help reduce the lint and tame its wiry 'behaviour'. I love the linen, and the huck lace but I'm so done with it now and ready to move on! I found trying to hard press the other linen runners literally gave me 'arm ache', so Bruce said to order a press and he'd pay for it. What a sweetheart! Some research and price comparisons and we got this one on line. Lynnette has one and had lots of good things to say about it and she has no regrets on buying hers. I would tend to agree and wish I had done it a lot sooner! After the runners came off the loom, I serged them apart and prepped them for hemming. Once my straight pins were in place I gave them a quick touch in the steam press and spent a couple of evenings hand sewing the hems neatly. There is something so nice about plying a needle and thread. I filled the laundry tub with warm soapy water and left them to soak for half an hour and when I came back, this is what I found. I gave them a good squeezing out to shift threads and get the excess dye out and rinsed very well. There was still some pink in the last water so I will mark these on the tag as 'hand wash separately' for sure! I don't recall my last batch of the red runners being quite so bad for fugitive dye. 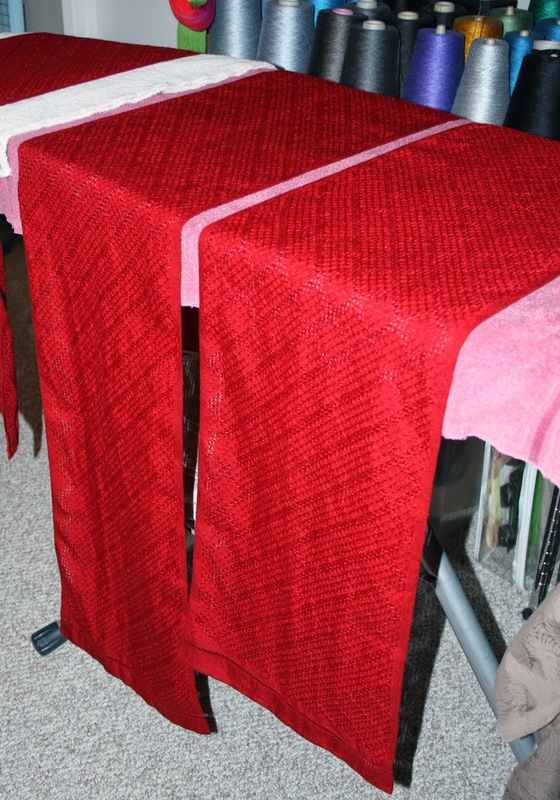 I rolled them into spare old towels to absorb the water and later before I was done for the day, I smoothed them out to dry overnight on towels on the ironing board. I gently shaped them and tugged them to the straight edges and corners I want to see in the final runner. I also neatly nipped off any weft yarn tails as well. The next morning I set up the press on top of the ironing board. I have to work out a better spot for it and that may be upstairs and work on the big kitchen counter. For now this set up will work as I knew I wanted to give them a final press with the hand iron afterwards. I hope you can see this okay (maybe click to enlarge?) but I had positioned and pressed the end hem and approx six to eight inches. There is a line between the newly flattened linen and the bumpy textured cloth on the right hand side. That's one press for about five seconds, using spritz of water on the cloth first and additional steam. I rolled up my metaphorical sleeves and got busy pressing the runners end for end and both sides. I'm still new to the machine so in time I will learn all the tricks to do a better faster job. I tried rolling the runner and tucking in behind the pivot but there was too much material. I thought I could just unroll a section at a time. Nope! Then I realized there would be a crease line regardless and so just did the easy pull through as shown above. The press did a beautiful job of flattening the cloth but there was little to no shine. I tacked on my "made by..." label and then fired up the hand iron. I didn't have to give that heavy downward pressure this time but simply smooth and bring out the shine. What a treat! So what's next? I have some ideas and I thought this might look good as warp.... its a variegated tencel called Sapphire Combo.